Ski jumping is a winter sport in which athletes compete on distance and style in a jump from a ski jumping hill. The sport has traditionally focused on a combination of style and distance, and it was therefore early seen as unimportant in many milieus to have the longest jump. The International Ski Federation (Fédération Internationale de Ski; FIS) has largely been opposed to the inflation in hill sizes and setting of distance records, and no world records have been set at Olympic, World Championship, Holmenkollen Ski Festival or Four Hills Tournament events, as these have never been among the largest hills in the world. Since 1936, when the first jump beyond 100 metres (330 ft) was made, all world records in the sport have been made in the discipline of ski flying, an offshoot of ski jumping where distance is explicitly emphasised. As of March 2017, the official world record for the longest ski jump is 253.5 m (832 ft), set by Stefan Kraft at Vikersundbakken in Vikersund, Norway. Two years prior, also in Vikersund, Dimitry Vassiliev reached 254 m (833 ft) but fell upon landing; his jump is unofficially the longest ever made. Ski jumping originated in Norway, and has been practiced since time immemorial, using handmade temporary hills. 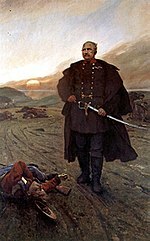 The first record is credited to Olaf Rye, a soldier who set up a show spectated by his fellow soldiers in 1808, reaching 9.5 metres (31 ft) in Eidsberg, Norway. This small hill was probably near Eidsberg church, possibly at the farm Lekum. Sondre Norheim, credited as the 'father' of modern skiing, made the second official record at 19.5 metres (64 ft) in 1868. Tim Ashburn says in his book The History of Ski Jumping that Norheim's longest jump on the circular track in Haugli ground in 1868 should have been measured at 31.5 metres (103 ft), but that newspapers in Christiania reported that the length "was a little exaggerated", so the official record is everywhere written as 19.5 m.
The sport quickly spread to Finland, the United States and Canada, where some of the subsequent records were set. Early jumping competitions were only scored by style, and it was seen as disruptive to attempt to jump further. Not until 1901 was a scoring system for distance introduced. With the construction of Bloudkova Velikanka in Planica, Yugoslavia, in 1934, the separate discipline of ski flying was introduced, which is essentially an 'extreme' version of ski jumping. 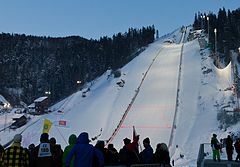 With one exception, all of the world records for distance have been set on five of the world's six ski flying hills, of which five remain in use. In 1936, Josef "Sepp" Bradl was the first to surpass the 100 metres (330 ft) mark, landing a jump of 101.5 metres (333 ft). The FIS was long opposed to ski flying as a whole, and it has never been included in the Olympic or Nordic World Ski Championships. However, since 1972, the FIS Ski Flying World Championships has been a mainstay event, and ski flying event are also part of the FIS Ski Jumping World Cup calendar. The first to officially reach 200 metres (660 ft) was Toni Nieminen in 1994, by landing a jump of 203 metres (666 ft); at the time, ski jumpers did not receive distance points for the part of the jumps exceeding 191 metres. The distance of a ski jump is measured from the end of the 'table' (the very tip of the 'inrun' ramp) to halfway between the athletes' feet when they touch ground. To qualify, the jump must be made in a sanctioned competition, or official trial or qualification runs for these, with a system to control the actual length. To win a competition, an athlete needs both distance and style, the latter of which is achieved by attaining a proper Telemark landing; therefore jumpers are not motivated to jump as far as possible, only as far necessary to attain a good landing. Jumps are invalid if the jumper falls, defined as touching the ground with his hands or body before reaching the fall line. However, if an athlete touches the snow with any part of their body after landing, and receives style points greater than 14 from at least three judges, the jump is valid and counts as an official world record. When ski flying began in the 1930s, jumps were recorded in a traditional Scandinavian measure of length, the Danish alen (1 alen (Denmark) = 0.6277 m (2.059 ft)). Some older United States and Canadian records were recorded in feet. Now, jump length is measured by the meter. Today, camera technology capably makes the measurements. Before, spectators were stationed downhill, meter by meter, and the raised hand of the nearest observer marked the jumper's landing. * Davos (2 Mar 1913) – many regard Thorleif Knudsen 48 m (157 ft) jumps as world records, although R. Omtvedt already set a new world record of 51.5 m (169 ft) on 16 Feb 1913 in Ironwood. This is most likely due to Omtvedt jumping as a professional at that time. If an athlete touches the ground with their hands, body, or falls before reaching the outrun line, the jump is deemed invalid and thus not listed as a world record. Jumps landed during non-competition training rounds or hill tests are also not recognized as official world records. Distances set by test jumpers (Vorspringer, or "V-jumpers") during competition rounds are deemed official. Revelstoke (1916) – Nels Nelsen landed a world record jump of 55.8 m (183 ft) during training; the latter is why it is officially not recognized as a world record. Salt Lake City (Jan 1931) – Alf Engen landed a world record jump of 77.4 m (254 ft), but according to Harold "Cork" Anson this was not recognized because the Utah Ski Club, the competition organizer at the time, had not been a member of the Confederation of Western American Winter Sports Association. Salt Lake City (1931) – Alf Engen landed a world record jump of 81.1 m (266 ft) during an unofficial event; the latter is why it is officially not recognized as a world record. Salt Lake City (1935) – Alf Engen landed a world record jump of 94.8 m (311 ft) during training; the latter is why it is officially not recognized as a world record. Plastic matting for ski jumping was invented by German athlete Hans Renner. The first ski jumping tests on plastic without any audience were made on 31 October 1954 at Regenbergschanze in Zella-Mehlis, East Germany. The Wadeberg Jugendschanze K40 in Oberhof, East Germany, which was built just next to the old Thüringenschanze, officially became the world's first plastic covered ski jumping hill. On 21 November 1954 they organized first ever and at the same time regional competition on plastic at »Wadeberg Jugendschanze K40« in front of 15,000 spectators where Werner Lesser set first two ever plastic/summer world records of 41 and 42 metres (135 & 138 ft). Russian ski jumper Dimitry Vassiliev holds the current summer world record on plastic with 147.5 metres (484 ft) which he set at Russian National Championships on 15 October 2016 in Sochi, Russia. ^ a b Canadian Ski Hall of Fame. "Nels Nelsen" (PDF). Archived from the original (PDF) on 15 February 2011. Retrieved 15 February 2011. ^ International Ski Federation. "Distance measurement". Archived from the original on 7 July 2011. Retrieved 15 February 2011. This page was last edited on 27 March 2019, at 21:12 (UTC).